Kompromat! 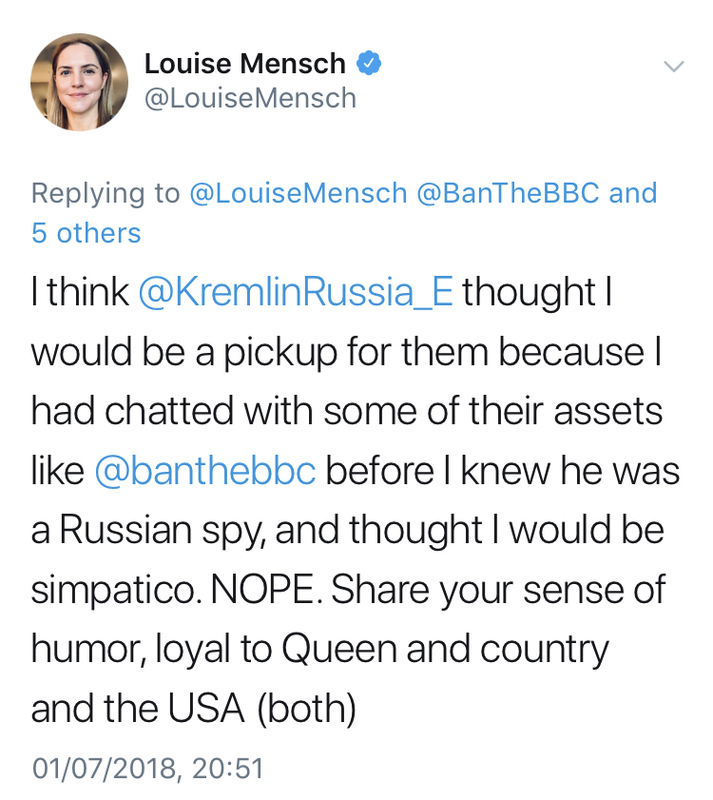 Yours truly has been outed as a Russian Spy by Louise Mensch. Elevated to that most coveted of prizes in contemporary Internet political discourse where people who disagree with you to the extent that demands only the very best. Not content with any mere ‘Russian bot’ slur, the status of full blown ‘Russian Spy’ must be conferred only by the innermost circle of intelligence community operatives. 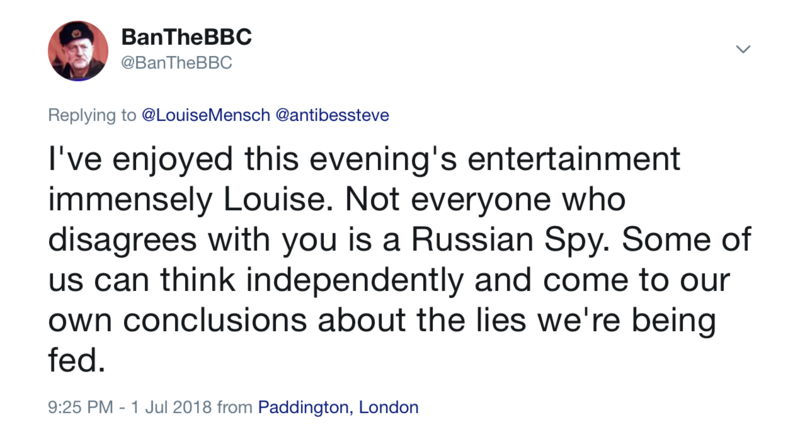 I speak of none other than Louise Mensch, a former UK MP, a blue tick Twitter verified endorsed personality and part-time Walter Mitty spook. It should go without saying that I am not a Russian Spy nor a Russian bot. I have never been to Russia, ever. I have, however, had copious amounts of Vodka and Coca-Cola from time to time: ‘Détente in a glass’. In this age of anti-Russia hysteria that probably is enough to make you a Russian spy in that left-wing rag The Guardian. However Mad Mensch could not possibly know about my drinking habits unless her pals at GCHQ have been filling her in. Exactly one week to the date of this post, I was in my favourite local Italian restaurant for dinner when my smartphone lit up with a stream of tweets from Menschy. The tweets accused me, inter alia, of being a “Russian Spy” and a “Russian Asset”. I laughed for two days straight after. This woman was once an elected conservative MP and by all appearances was taken seriously. Many have said that she did ‘hard drugs’ in her youth and this messed up her mind later in life: I don’t doubt it. Notice the use of the American term “Dude”. Yes, I am your everyday, happy go lucky, Russian Spy… DUDE. 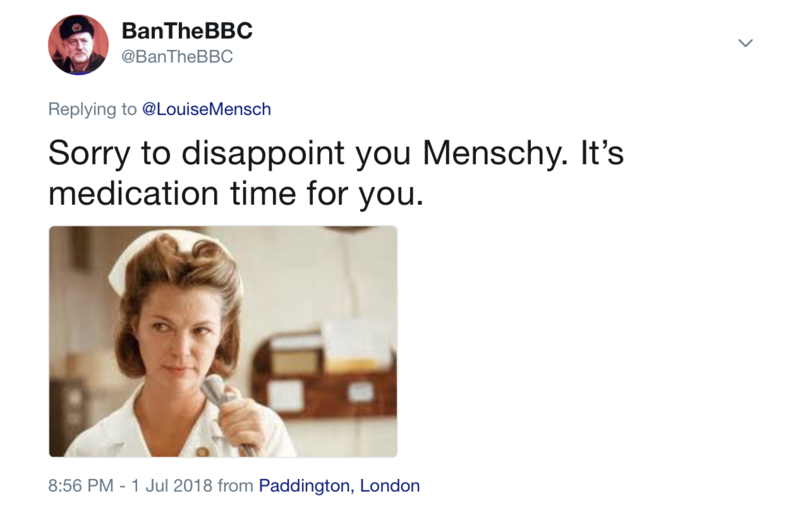 I ignored previous warnings from many others that Louise Mensch was batshit and out of control. 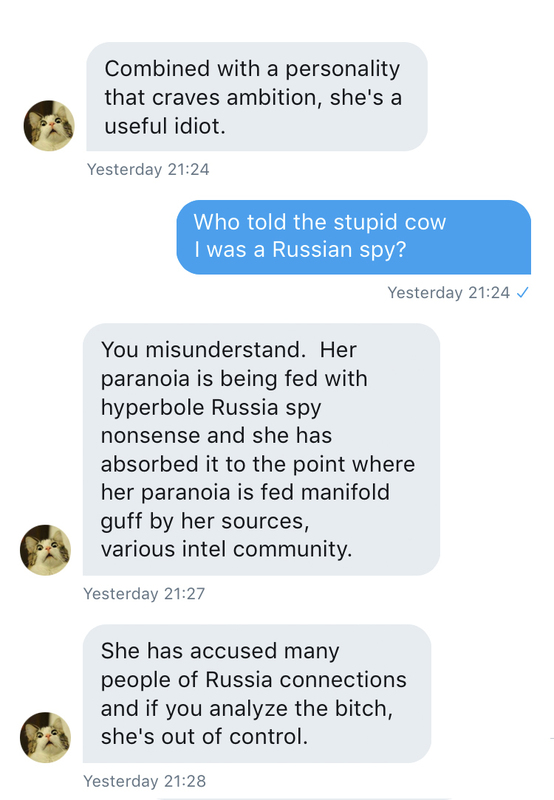 Spraying around unfounded allegations about innocent people being Russian spies makes her look like a complete fool and has now finally convinced me they were right. She’s an unhinged, mental headcase. By her metrics, everyone is a Russian bot. Because at some point they exhibited critical thinking and did not agree with her. Hey, this sounds like those Far Right Wingers in the 90’s who hated gay people, and tuned to be closet gay people in denial! Maybe she is a really Ruuskie! 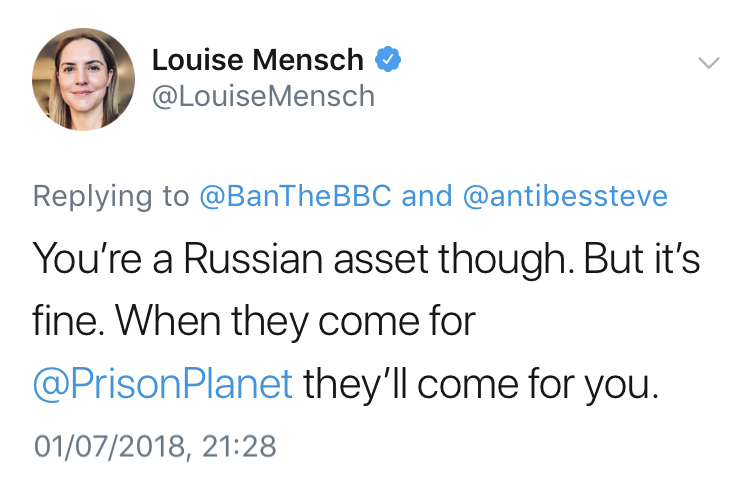 Louise Mensch is possibly the craziest woman I’ve ever encountered on Twitter, what with her crazy conspiracy theories and constant accusations of being Russian. What does she have against Russians anyway? It’s not that she’s insane, it’s the voices in her head that are insane. If she’s not completely mad & is spreading this disinformation in all seriousness then, I think the lady doth protest too much. She is potentially projecting her own ‘faults’ onto others & is herself a Russian spy!! It goes a lot deeper than what lies on the surface. She championed for neo-nazi propaganda and Brexit to the point where she got buddy-buddy photos with Milo Yiannopoulos and claimed he WASN’T a neo-nazi but a Conservative. It wasn’t until his pro-paedophillia speeches that she disavowed him; you heard me right… she only disavowed him for that, not for the fact he’s a neo-nazi. She’s sexist, racist, transphobic and ableist to the point where she believes “gamergate” wasn’t an attack on female game developers, that the #MeToo, #BLM, #familiesbelongtogether and #guncontrolnow movements were “Russian Deza”. She also said all the women who came out about Schneiderman were lying, opportunistic whores. So you tell me, from all this about her… is SHE the one who is really the neo-nazi and RIS agent? 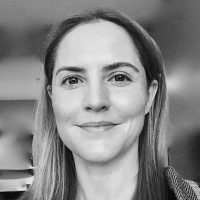 PS: She was also involved in the #VoteLeave campaign which has been linked to Cambridge Analytica, Michael Gove, Boris Johnson, Nigel Farage, and Jacob-Rees Mogg (who is also the Godfather of her children).